DIRECTOR RAYA MARTIN is a young filmmaker (only 31) who gets to direct his first full length film for commercial release in “Smaller and Smaller Circles”. 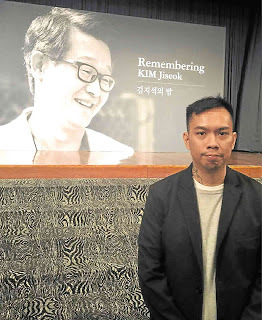 Prior to this, he has made a lot of short films, some docus and feature films that are experimental and cater to a very limited art market, like “Autohystoria” (2007), “Now Showing” and “Next Attraction (2008, both about filmmaking), “Independencia” (2009), “Manila” (co-directed with Adolf Alix), and “How to Disappear Completely” (2013). He’s a great favorite in Tikoy Aguiluz’ Cinemanila International Filmfest where he won so many awards. It will be a great challenge to entice audiences to watch this dark material about a serious killer who murder innocent boys, when romcoms and comedies rule the local film industry. Their lead actors are not considered top box office draws, Nonie Buencamino and Sid Lucero as priests who become detectives, so they are taking an active campaign in selling it to various colleges and universities all over the country. “We are promoting it to educators, teachers and the regional press, so they can tell their students to watch it and, so far, it’s very well received,” says the film’s producer, Ria Limjap. It’s of interest to note that the first movie shot there was ‘Batch 81’ by Mike de Leon which starred the late Mark Gil, and now, ‘Smaller and Smaller Circles’, which stars his son, Sid Lucero as Fr. Jerome Lucero. Sid Lucero was the name of Mark’s character in ‘Batch 81’.